I should start by saying that I do loads of enrichment, I probably own every active feeder ever designed, from the snakey ones, to the ones for really clever dogs, to the chewy and bouncy ones and I use them every single day and each day my dogs do loads of enrichment activities. I use enrichment so much that if you told me you were taking my kongs away I’d probably cry. I’ve started to wonder recently if we’re doing too much enrichment and are we sometimes doing it for the wrong reasons? Enrichment aims to ‘increase physical and psychological well being and to increase positive natural behaviours and decrease abnormal problematic behaviours’. Enrichment began in zoo animals to prevent repetitive behaviours caused by deficiencies in the environment and they were using enrichment to make up for the fact that captive zoo animals can’t live natural lives and can’t exhibit all of their natural behaviours. 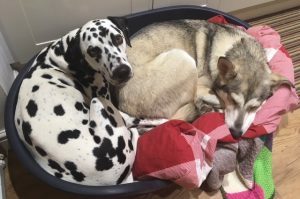 We need to be careful to think about the canine ethogram and all those behaviours a dog should be able to naturally perform and needs to perform to stay healthy (mentally and physically). The canine ethogram includes many important behaviours that aren’t just feeding including grooming, play, social sleeping etc. Our enrichment activities need to go far beyond active feeding and we should be making sure that their need for play, companionship and rest are met appropriately too. Sometimes we’re doing lots of enrichment to make up for a lack of social contact, we all lead busy lives and many of us can’t help that we have to work and leave the house and can’t be there with our dogs all day and many dogs don’t have the social contact of another dog. Are we providing excessive levels of active feeding and ‘entertainment’ to make up for social contact? Perhaps we could schedule more play dates with dog pals (if they have any) or take our dog to visit human friends they like after work to add enrichment too, maybe we could sit with them while they eat so that they have social contact when eating. We need to make sure we’re not using enrichment to paper over the cracks of behavioural issues (I know I’ve been guilty of doing this too!). If we’re giving loads of enrichment as they are destructive when they are left then we really need to work on why they aren’t happy about being left alone and not try and manage it just by giving then 4 frozen active feeders. If we’re using enrichment as they are annoying or attention seeking then really we need to work out why they are doing this. • a digging pit- digging in sand or soft soil is rewarding for many dogs and encourages exploratory behaviours. • Scent work- using scented toys or objects can be a good activity to do together, do a choice test to see which scents your dog prefers. • Sensory gardens can be as simple as a few pots of plants and can help your dog to explore new scents, sounds and textures. When we are using active feeders it’s important that we make sure our dogs are enjoying enrichment and not just doing it as they are hungry and have no option as that’s the only way they can get their food. I always try to do (very unscientific) preference studies with my dogs- I give them the choice of some food from a bowl and some from an active feeder. 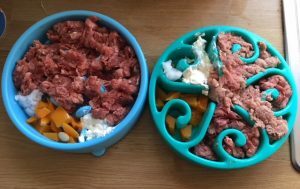 My dogs will pretty much always choose food out of some of the slow feed bowls I have rather than out of a ‘normal’ bowl so I feel okay that they are ‘happy’ to eat from this type of feeder. Do things together and don’t fall into the trap of only offering enrichment when your dog is home alone or when you want to keep them busy. 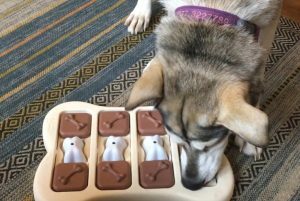 We all need to keep our dogs occupied sometimes but they’d probably like you to be there with them and participate in their activities too some of the time. We also need to look at the emotional responses we are seeing in our dogs when we doing enrichment. I don’t want to see my dogs looking frustrated and highly aroused, I want them to be calm, with soft facial expressions and relaxed body language. One of my dogs has pretty poor frustration tolerance (Sylvi inuit!) and so really frustrating toys would not be good for her and she’s be likely to bark at them and get ‘cross’ with them but over time by really carefully using progressively trickier toys she has developed (slightly!) better self control. It needs to be gradual though so that emotionally they still feel happy when they are doing their enrichment activities. It’s like us trying to do The Times cryptic crossword when we’ve barely managed the quick crossword before! We should also try to measure the success of our enrichment activities, what behaviours are we seeing during and after doing them? Are we seeing more behaviours we like and less that we don’t like? 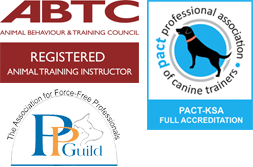 Are our dogs calm and restful after their activities? Which activities work best for them and which don’t? 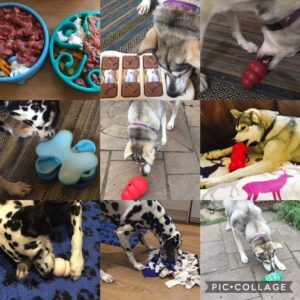 So in summary, enrichment is a great thing and it’s wonderful that we are all trying to add more fun to our dogs lives, we just need to think carefully about the activities that we offer and try to ensure that we aren’t restricting ourselves to just using activity toys when there’s so much more we can do together with our dogs.